Vehicle Mounted Arrow Boards-OPTRAFFIC CO., LTD.
Optraffic vehicle-mounted arrow boards are made to the highest quality standards in our ISO9001 certified manufacturing facility, comply to MUTCD, allow for mounting over any vehicles with actuators and brackets, foldable and easily operated. 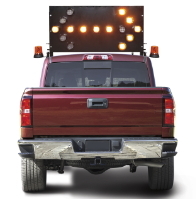 OPT vehicle-mounted arrow boards are built to meet CE & AS Standards, with wide angularity and superior visibility, provide an obvious solution for convoys, crash-cushion (TMA) trucks and emergency repair crews. All models are available in different sizes and configurations. Optional Lamps Choices: 13, 15 or 25 lamps, all double sided available. All OPT vehicle-mounted arrow boards are with high-efficiency LEDs for reduced energy consumption, superior performance, and outstanding legibility. Vehicle-mounted arrow board supplied by OPT are with13, 15 or 25 lamps, shown as above picture, can be produced with double sided arrow boards (26, 30 or 50 lamps), flashing rate is 30-40 per minute. 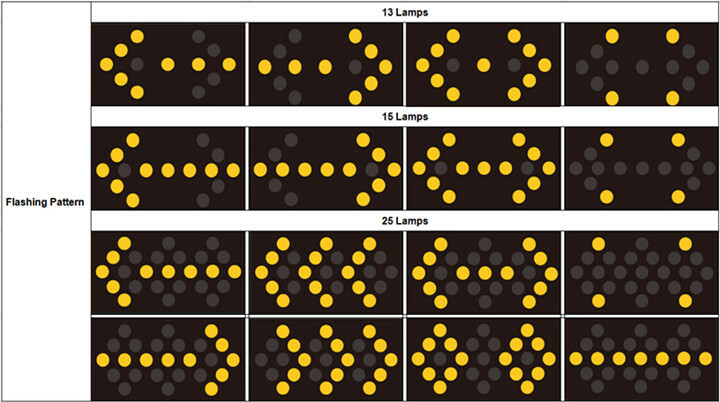 Customized flashing patterns are all available.